Physical Environment, Well-being, Money and Relationships. These 4 areas are the cornerstone for a strong and healthy life and the program helps a person to clean up, restore and polish virtually every aspect of his/her life. The program takes between 6 – 24 months to complete. The participant’s goal is to get a score of 100 out of 100. The objective of the program is for the participant to get complete about 100 possible incompletions in their life. Incompletions are those physical, emotional or mental items, which are in some way not resolved in the current moment. Incompletions of any kind drain energy. That is, they require energy to live with, given it takes work to keep us whole when there is something in the space. To have full integrity (like a complete circle) is normal; the program gives one a way to get there in a natural way. You will have more energy and vitality. There is nothing like a clean space, full communication and self-responsibility to give one more energy. You will increase your scores just by being in the program. Once you go over the list of the 100 items, you’ll find yourself handling some of these without even trying. Others take more work, but you will complete your way toward the score of 100. You will gain perspective on who you are, where you are and where you are going. When incompletions are handled, one can see what is and has been around them, including one’s self. You will see situations as they really are, you’ll discern what is going on with you and around you and you’ll react less and choose more in your daily life. This higher perspective is essential in the process of designing one’s life and it starts with the Clean Sweep Program. There are 4 steps to completing the Clean Sweep™ Program. Answer each question. If true, check the box. Be rigorous; be a hard grader. If the statement is sometimes or usually true please DO NOT check the box until the statement is virtually always true for you. (No “credit” until it is really true!) If the statement does not apply to you, check the box. If the statement will never be true for you, check the box. (You get “credit” for it because it does not apply or will never happen.) And, you may change any statement to fit your situation better. The number of True boxes for each of the 4 sections will be totaled automatically for you as you complete each of the 4 sections. Write down these totals on a separate sheet of paper and then add them up. You know where your baseline or starting point lies. Keep playing until all boxes are filled in. You can do it! This process may take 30 or 360 days, but you can achieve a Clean Sweep! Use your coach or a friend to assist you. And check back once a year for maintenance. My personal files, papers, and receipts are neatly filed away. My home is clean and tidy. (Vacuumed, wardrobes and drawers organized, desks and tables clear, furniture in good repair; windows clean). My appliances, machinery and equipment work well. (Fridge, toaster, lawn mower, water heater, hi-fi etc.). My clothes are all ironed, clean and make me look good. (No creases, piles of washing, torn, out-of-date or ill-fitting clothes). My plants and animals are healthy. (Fed, watered, getting light and love). My bed/bedroom lets me have the best sleep possible. (Firm bed, light, air). I live in a house/flat that I love. I surround myself with beautiful things. I live in the geographical location of my choice. There is ample and healthy lighting around me. I consistently have adequate time, space and freedom in my life. Nothing in my environment harms me. I am not tolerating anything about my home or work environment. My work environment is productive and inspiring. (Synergistic, ample tools and resources; no undue pressure). My computer works very well and fully supports my efforts. My hair is the way I want it. I back up my hard drive at least monthly. I surround myself with music which makes my life more enjoyable. My bed is made daily. I don’t injure myself, fall or bump into things. People feel comfortable in my home. I drink at least 2 liters of water a day. I have nothing around the house or in storage that I do not need. I am consistently early or easily on time. I rarely use caffeine. (Chocolate, coffee, colas, tea) less than 3 times per week, total. I rarely eat sugar. (Less than 3 times per week). I rarely watch television. (Less than 5 hours per week). My teeth and gums are healthy. (Have seen dentist in last 6 months). My cholesterol is at a healthy level. My blood pressure is at a healthy level. I have had a complete physical examination within the past 3 years. I do not smoke tobacco or other substances. I do not use illegal drugs or misuse prescribed medications. I have had a complete eye examination within the past two years. (Glaucoma check, vision test). My weight is within my ideal range. My nails are healthy and look good. I don’t rush or use adrenaline to get the job done. I have a rewarding life beyond my work or profession. I have something to look forward to virtually every day. I have no habits which are unacceptable to me. I am aware of the physical or emotional problems or conditions I have, and I am now fully taking care of all of them. I consistently have evenings, weekends and holidays off and take at least four weeks of holiday each year. I have just the right amount of sleep. I laugh out loud every day. I walk or exercise at least three times per week. I hear well and protect myself from loud noises / concerts / music. I currently save at least 10% of my income. My income source/revenue base is stable and predictable. I know how much I must have to be minimally financially independent and I have a plan to get there. I have returned or made-good-on any money I borrowed. I have written agreements and am current with payments to individuals or companies to whom I owe money. I have 6 months’ living expenses in an easily accessible account. I live on a weekly budget which allows me to save and not suffer. All my tax returns have been filed and all my taxes have been paid. I currently live well, within my means. I have excellent personal insurance. (Life, accident, disability, medical etc.). My assets (car, home, possessions, treasures) are well-insured. I have a financial plan for the next year. I have no legal clouds hanging over me. My will is up-to-date and accurate. Any parking tickets, alimony or child support are paid and current. My investments do not keep me awake at night. I know how much I am worth. I am on a career / professional / business track which is or will soon be financially and personally rewarding. My earnings are commensurate with the effort I put into my job. I have no “loose ends” at work. I am in relationship with people who can assist in my career/professional development. I rarely miss work due to illness. I am putting aside enough money each month to reach financial independence. My earnings outpace inflation, consistently. I have told my parents, in the last 3 months, that I love them. I get along well with my sibling(s). I get along well with my coworkers/ clients. I get along well with my manager/staff. There is no one whom I would dread or feel uncomfortable “bumping into”. (In the street, at an airport or party). I put people first and results second. I have let go of the relationships which drag me down or damage me. (“Let go” means to end, walk away from, declare complete, no longer be attached to). I have communicated or attempted to communicate with everyone whom I have hurt, injured or seriously upset, even if it wasn’t fully my fault. I do not gossip or talk about others. I have a circle of friends/family who love and appreciate me for who I am, more than just what I do for them. I tell people how they can satisfy me. I am fully caught up with letters and calls. I always tell the truth, no matter what. I receive enough love from people around me to feel good. I have fully forgiven those people who have hurt/damaged me, intentional or not. I am a person of his/her word; people can count on me. I quickly correct miscommunications and misunderstandings when they do occur. I live life on my terms, not by the rules or preferences of others. I am complete with past loves or spouses. I am aware of my wants and needs and get them taken care of. I do not judge or criticize others. I do not “take personally” the things that people say to me. I have a best friend or soul-mate. I make requests rather than complain. I spend time with people who don’t try to change me. Add your totals from the four sections. Initial scores for the first-time participant range, on average, between 30 – 70 points out of the 100 points possible. Most people who are “using” the program increase their scores between 2 and 6 points per month. Points are added more quickly at first, slowing down significantly after one has added 20 or so points. Major plateau areas are at 70-75, 85-90 and 95-100. Those last 5 or 10 are the ones which are most worth taking care of, given our egos are well entrenched among these incompletions. You want to take this program on with the intention of getting a 100. This program is part of establishing a Strong Personal Foundation. With this strong base, one can build a vibrant and attractive future. But it requires an investment. This program is a backdoor approach to personal growth, business success and happiness. Rather than chase goals or try to figure out one’s life purpose, better to get the stuff out of the way so you can get the perspective you need to make better decisions and attract what you really want. One of the goals is to stop having problems, handle the incompletions you have currently and maintain a clean space, forever, so you can create as you were designed to. The Clean Sweep Program is the first step in that process. source: CleanSweep Program ™ (c) 1998 Coach U Inc. Creating a vision board can be a useful tool to help you conceptualize your goals and can serve as a source of motivation as you work towards achieving your dreams. It’s one thing to think about your dreams and goals… but it’s another to actually take the time to make a vision board. Because making a vision board means externalizing your thoughts. It means doing something. You are going to have to think and look deep into yourself first, and then do some research to find images and positive affirmations that represent these goals and dreams. Then you are going to have to find the proper board and print images or draw them. It takes time and energy and that means you’ve already made a step towards the new life you want. Check out this blog: The Reason Vision Boards Work and How to Make One – It’s useful and interesting! I see this with people who set major goals for the year. Let’s say they want to lose weight, write a book, or start a new business. Dreaming up big results can be emotionally satisfying and intellectually stimulating. make room in your schedule for the gym? find the hours it takes each week to sit and write? know if your new product has enough demand in the marketplace? Those are all good questions. And they’re important to answer. But they don’t encapsulate the real risk. They don’t even come close. The real risk is this: When facing these sorts of challenges, instead of taking action, we can coast on the good feeling of the dream without taking the necessary steps to see it realized. The Law of Diminishing Intent says, the longer you wait to take action, the less likely you will be to take it. Jim Rohn originally noticed this phenomenon and coined the term. 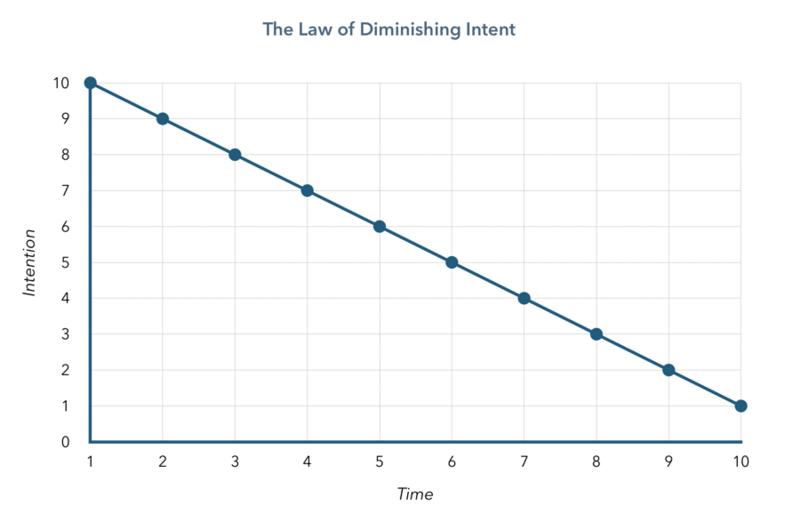 Check out this article on four steps to take to overcome the Law of Diminishing Intent. It’s useful and interesting!